It is well known that portfolios that blend stocks and bonds perform well because their major asset classes are anti-correlated. There are a few major weaknesses in the way these portfolios are typically managed however. Namely that the ratio of stocks to bonds is usually fixed, and also that they don’t always use the best representatives of their asset classes. BlackDog is an investment strategy that leverages a macro economic model to direct allocation between equities and fixed income. The macro model is covered in another, recent blog. The strategy is conservative because it invests long-only in large cap US stocks and liquid US fixed income instruments. In investment simulations (back tests) and live trading, the strategy significantly outperforms market benchmarks. Dynamic allocation: Instead of a constant 60/40 allocation between equities and bonds, we adjust the ratio based on a macro economic model. This active approach reduces exposure to stocks during uncertain times, while increasing exposure during bull markets. Better fixed income instruments: The standard bond component of the 60/40 strategy is not responsive to moves in the equity markets. We replace it with a more active group of securities that provide a stronger hedge in market downturns. Better equity selection: We skew the portfolio towards lower market cap stocks and value stocks. When these three techniques are combined, the result is a portfolio that provides superior return with low volatility and risk. 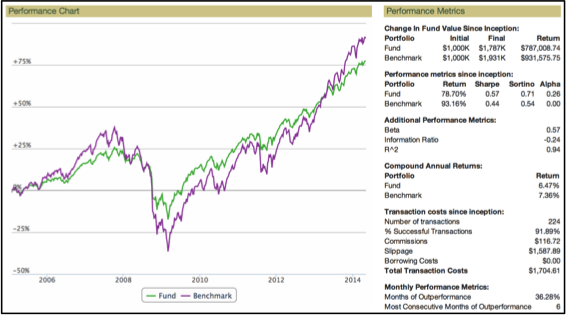 60/40 portfolio (green) versus the S&P 500 Total Return benchmark (purple). It provides diversification across the most important asset classes in the US. It is weighted in favor of equities, which have a strong history of outperformance. It includes bond exposure to “cushion” against severe downturns. Lower volatility: 0.77% versus 1.32% for the market. Reduced drawdown: 35.53% versus 55.25% for the market. Higher Sharpe Ratio: 0.57 versus 0.44. These are great performance features, but they come at the cost of lower return than the market overall. Can we improve on that while retaining these features? We think so, and we describe how below. How can we predict market strength or weakness? Short-term market timing is challenging, and may not be appropriate for conservative portfolios. However, we believe that macro economic indicators have strong longer-term predictive capability, and that it makes sense to pay attention to them. In a recent blog we showed how an ensemble of macroeconomic factors could be used to forecast market strength. We’ll avoid going into detail on that method here, please read the other article for details. Lucena’s macro economic model for market strength from 1988 to 2014. The top (blue) line represents the indicator, where a larger value is bullish and small values are bearish. The bottom (red) line represents the value of the S&P 500 index. Historical performance of the S&P 500 (blue) and AGG (red, aggregate bond index fund). We addressed the challenge of asset allocation between stocks and bonds with the macro economic model discussed above. But another problem remains: Which securities are the best representatives of these asset classes? In order to achieve optimal performance, each of the components of a portfolio should serve a role and work together with the others. Most investors simply view the bond component of their portfolios as the “safe” part that provides a fallback in case of an equity market crash. Typically, wealth advisors suggest a blend of corporate bonds, treasuries and other instruments to fill the fixed income role. The AGG ETF holds all of these types of securities and is representative of the sorts of instruments used in many 60/40 portfolios, so we used it in our baseline 60/40 portfolio. 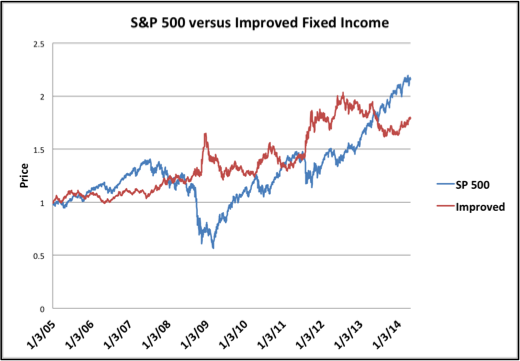 A more active set of fixed income securities (red) provides a better hedge for equities. The figure at right illustrates the comparative performance of AGG and the S&P 500. As you can see, AGG provides non-volatile increasing value over time. That’s great, but we want more. We argue that the fixed income component should provide a more active hedge for equities. The problem with AGG and other, similar fixed income securities is that they are not reactive: In other words, when the market drops significantly, these standard instruments don’t respond by increasing in value to offset the loss. In our BlackDog strategy we use more active fixed income securities (see figure below right). Notice that our new instrument (red) is strongly anti-correlated with equities (blue). Even so, both groups of securities increase in value over time. At first it might seem that combining these two somewhat volatile components in to a portfolio could lead to a more volatility or risk. But it’s just the opposite, with frequent rebalancing these sorts of securities provide the recipe for a great portfolio: A basket of assets whose volatilities cancel each other’s out while simultaneously increasing in value over the long run. This is a cornerstone of Modern Portfolio Theory. Our overall strategy then is to utilize the macro economic model to set an allocation of 30% to 70% large cap stocks with the remainder allocated to fixed income securities. We carefully select high quality securities for both the large cap side and the fixed income side so they are responsive to one another. 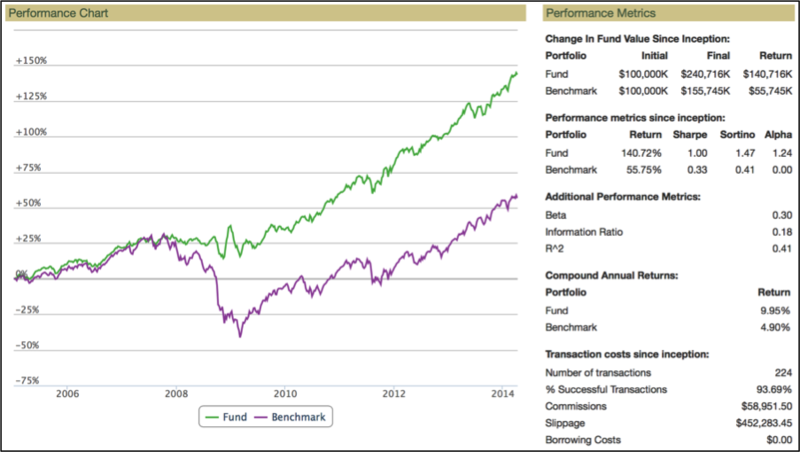 BlackDog performance (green) in backtesting versus the S&P 500 benchmark (purple). In the table below we list some of the key performance criteria of our benchmark, the 60/40 and our strategy, BlackDog. BlackDog provides 50% higher cumulative return than the market at less than ½ the volatility and about 1/3 the drawdown. Turnover averages about 5% per month. In the figure on the next page below we provide a backtest of BlackDog from the beginning of 2005 to May 2014. In our backtesting (market simulation) we initialize a portfolio with $100M in cash. We then allow the strategy to allocate between large cap stocks and fixed income and rebalance monthly. The simulation is intitiated in January 2005 and continues through late April 2014. The simulation includes commissions and market impact simulation of 5bps for each trade. We do not use leverage. Note that due to the anticipatory shift from equities to fixed income, BlackDog avoids significant downturn in 2008. Similarly, it shifts back into stocks in 2009, then benefits from the strong bull market since that time. 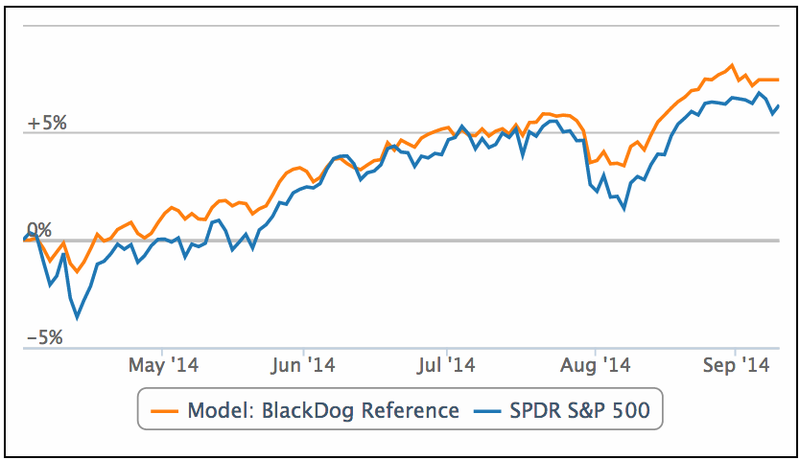 BlackDog outperforms the market in terms of total return at lower volatility and lower drawdown. The strategy provides consistent, low volatility returns. Performance of BlackDog (orange) in forward testing from April 2, 2014 to September 11, 2014. The benchmark (purple) is the ETF SPY. BlackDog has been traded live since April 2, 2014 (see chart at right). Its performance in live trading since that time is similar to our simulated results in terms of performance versus the market. Specifically: Volatility is substantially lower than that of the S&P 500 (37 bps versus 57 bps per day), Sharpe Ratio is 2.83 versus 1.83 for the market, and cumulative return is 1.29% over that of the market. The primary risks for BlackDog are stock market risk (how with the S&P 500 perform?) and interest rate risk. Of these, interest rate risk is probably the more important because we believe that when interest rates increase, the overall market and fixed income will be impacted negatively. Please read a separate article about interest rate risk here. Disclaimer: This information has been prepared by Lucena Research Inc. and is intended for informational purposes only. This information should not be construed as investment, legal and/or tax advice. Additionally, this content is not intended as an offer to sell or a solicitation of any investment product or service. Please note: Lucena is a technology company and not a certified investment advisor. Do not take the opinions expressed explicitly or implicitly in this communication as investment advice. The opinions expressed are of the author and are based on statistical forecasting based on historical data analysis. Past performance does not guarantee future success. In addition, the assumptions and the historical data based on which an opinion is made could be faulty. All results and analyses expressed are hypothetical and are NOT guaranteed. All Trading involves substantial risk. Leverage Trading has large potential reward but also large potential risk. Never trade with money you cannot afford to lose. If you are neither a registered nor a certified investment professional this information is not intended for you. Please consult a registered or a certified investment advisor before risking any capital. Can we know more details regarding to the improved instrument that is anti-correlated to S&P500? Thanks! That is available to Lucena Research clients. Hi, is there any plan to take in retail traders/investors as Lucena Research clients? Thanks. Randy, we’re hoping soon to provide some of our strategies as ETFs. Interesting. Is there any look-ahead bias in the macro model? Ie: did you use metrics that would have predicted the 2008 crisis post hoc? Yes, the macro model was developed post hoc. We believe that this is not so terrible because of the extremely long backtest (26 years) and small number of factors (10). Interesting, but how do you make sure your macro model is simply correct mainly by pure chance? Look ahead bias was mentioned here and I can add data-mining bias, over-fitting and similar pitfalls. Also, it seems that the model indeed shows dramatic low levels corresponding to the dramatic market drawdowns in 2000 and in 2008. As far as I can see from the 1988 to 2014 model chart, it shows another big bottom (0 level) around 1991 too, where the market was down but relatively moderately down and for shorter time. So again 2 out of 3 is good but with what significance level? And finally, do you use your model for re-entry to the market, and how (is it not a lagging indicator for market recovery)? >> how do you make sure your macro model is simply correct mainly by pure chance? A correlation analysis or T-test would address that. We haven’t done that, but I agree it would be a reasonable test. To some extent the backtest provides an assessment as well. Overall, for all data mining approaches there is a risk of overfitting. The only true test is forward testing — e.g. bet real money. So far this is working well, since April 2, 2014 with real money. Read more of the article, the answer is there. We’re always in the market. Our model is used to help us balance between fixed income and stocks. So it seems like, Uncle Milton to the contrary, you’ve come up with the proverbial free lunch. I’ve personally been toying with a similar in spirit, but less complicated idea, that allocates between stocks and bonds based on (more or less) how expensive equities (Shiller P/E) are relative to bonds (10 year Treasury yield). Anyway, I was wondering if you could given an example of how you construct your “improved” fixed income asset, assuming it is not proprietary. Sounds like you are amplifying, say, a bond index through derivatives of some sort, and not just riskier bonds or something, but I’m just an amateur guessing in the dark as it were. BTW, I’m taking your Coursera class at the moment, and wanted to thank you for offering it. Will part 2 show up on Coursera any time soon? Thanks An-Jen, the detailed composition of the bond side is proprietary. Part II of the course will be part of a course offered at Udacity in the Fall.